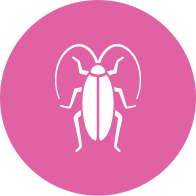 Pink Pest Services provide a full range of pest control and termite services for both residential and commercial customers. Keeping pest numbers down is important to protect your home, family and pets. In fact there are many insects that are more than just a nuisance. For example, cockroaches, spiders and mosquitoes can deliver painful bites and cause disease. This is why we can offer a 12 month warranty on our general pest treatments to houses.